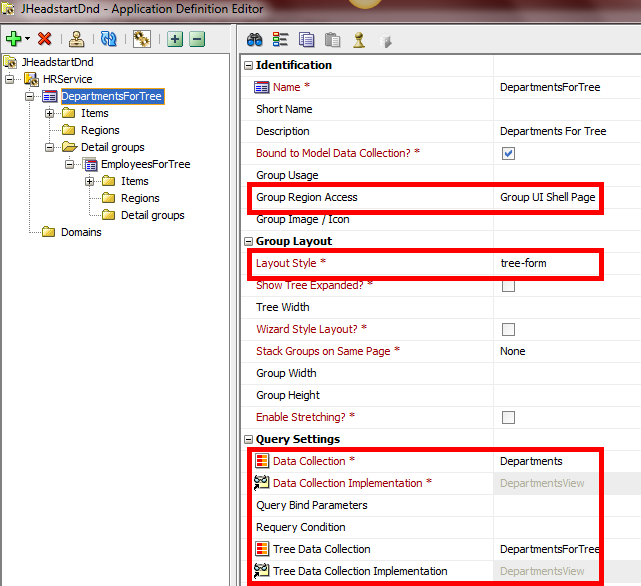 A little over two years ago I wrote a post on drag and drop in an adf tree component. That post was based on ADF only. 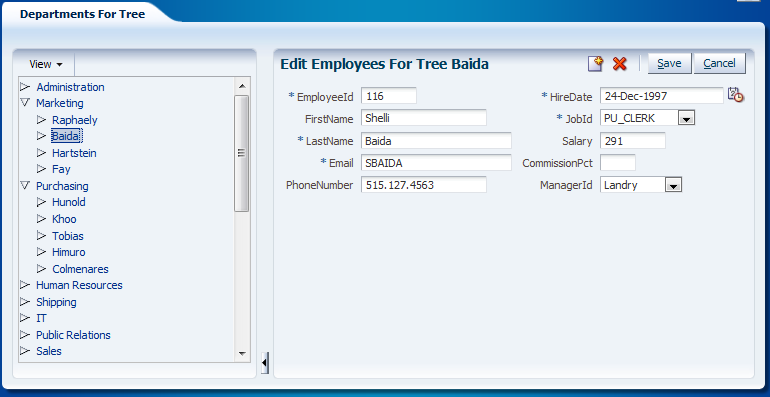 In the following post I show that you can have JHeadstart generate a tree for you that supports drag and drop. Not out of the box, but with use of custom templates, and some ADF knowledge. 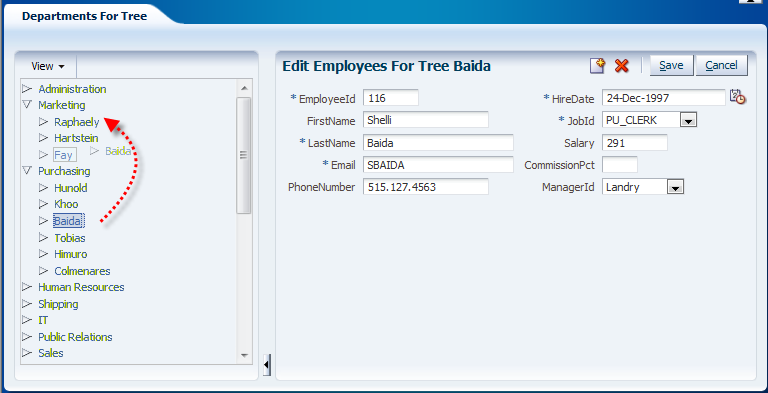 We start with the creation of an application module based on departments and employees. 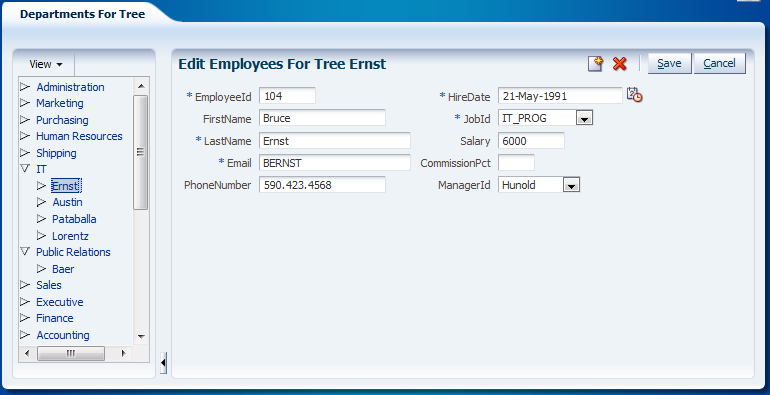 After enabling JHeadstart on the ViewController project, we edit the ServiceDefinition so it is configured to generate a Tree-Form layout by using the default JHeadstart templates. This will create a treeForm layout with the tree on the left, and the corresponding form on the right. The drag and drop will be implemented by the code snippet below. 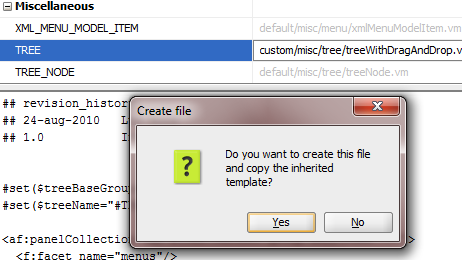 We only need to add this code to this new template, just before the end tag of the tree component. The same goes for the bean definition. Create a new template to hold the managed bean that implements the drag and drop functionality. We will do this in a template that is derived from the groupAdfConfig template. The default AdfConfig for the group will be generated with our “MoveBean” as valuable addition. As you can see, the managed bean class for the MoveBean is ‘nl.amis.technology.view.beans.MoveBean’. 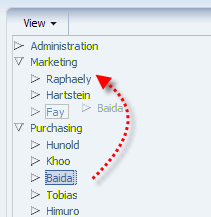 The code of this MoveBean class for drag and drop of employees is posted in the snippet below. Generate the application again, and run it. Here’s the result after the drag and drop. Luc Bors on AMIS Technology Blog: Dropping Trees. Luc Bors is Expertise Lead ADF and technical specialist/architect at AMIS, Nieuwegein (The Netherlands). He developed several Workshops and training on ADF and also is an ADF and JHeadstart instructor. Luc is a member of the ADF Methodology group and publishes articles on ADF in oracle technology related magazines, on the AMIS technology blog, (http://technology.amis.nl/blog).